Triboro – Real Marketing Ltd.
Commercial, industrial and warehouse pallet rack storage systems offer steel construction and ease of installation. We manufacture the widest range of industrial, warehouse and commercial steel shelving units made in the USA. We have heavy duty and light duty storage systems that are manufactured from cold rolled steel for high strength and durability. Use Rivet Rack to create anything from counter units, tire racks, packing tables, garment/hang rod units, bulk storage, molding or long parts. Rivet Rack’s commercial quality storage system sets up with just a rubber mallet—no nuts, bolts or clips are required on standard units. Units wider than 48” do require a tie support and hardware. Rivet Rack’s universal beams, posts, and T-posts tie shelving units together to make it even more economical and convenient to use. since no cross-braces are required, storage can be accessed from either side, making this hand-loading only storage system even more efficient. Take down and reassembly is also a snap. Rivet Rack also offers particle board decking or sprinkler-friendly wire mesh decking to meet your exact needs. Open shelving units are ideal for economical, general purpose storage. They allow light to penetrate a storage area and provide for free air flow around stored materials. Standard side and back sway braces made from 12 gauge steel are used to stabilize open shelving units. Braces are punched to attach to upright posts with nuts and bolts. Sturdy units provide heavy duty storage for records, warehouses and industrial applications. Our boltless design ensures easy assembly and quick set-up. These steel rolling trucks and carts provide sturdy movement of industrial, medical, office and computer materials. Bin storage units, cabinets and dividers for small part storage systems, organization and dispensing. 14 gauge upright posts, punched on 1″ or 1-1/2″ centers, support a heavy load of small parts. The bin dividers can be moved, added to or removed at any time to accommodate changing storage needs. Legs feature double electrical knock outs front and rear. Available in either adjustable or flared leg models. All steel components receive a three stage Pre- Treatment Process for increased durability of the hard baked enamel finish. Optional features include lower and upper storage shelves and a smooth gliding, fully enclosed, steel case drawer. Provides excellent work surface. The top and bottom are 3/16” hardboard. The core is edge glued lumber with clear hardwood bands sealed with catalyzed varnish. 1 3/4” thick. Features two 5″ swivel casters with brakes and two 5″ rigid casters for maximum mobility and lock in place stability. • Allows maximum utilization of floor space. • Same generous work area as the open or cabinet units. • Bottom shelf is recessed for extra leg room. • Provides extra storage capacity and security. • Double swinging doors feature 3-point locking device and durable handle. • Includes 2 full lower shelves. • Storage cabinet outside dimensions are 29”d x 34”w x 28-3/8”h. Opening with door frame measures 30-14”w x 27”h. 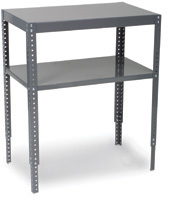 • This heavy duty work table is perfect for all types of applications – assembly, machine mounting, repair, and also serves as an extra storage area. • Top is 14 gauge steel and lower shelf is 18 gauge steel. • Legs are adjustable; available in two sizes and two height spans. Tri-boro offers a superior line of shop desks. These sturdy desks were designed with daily use in mind – they’ll help keep you organized and also offer convenient and secure storage. Our shop desks are ideal for shippers, checkers, dispatchers, mail rooms and receiving departments. The writing service is sloped and smooth. The three compartment work organizer is perfect for convenient access to supplies or documents. The center drawer glides smoothly on nylon rollers and has a built in grooved key-lock for security. The full size drawer measures 24”w x 27-14”d x 3-1/2”h. Each desk is manufactured from high grade steel and receives a three stage Pre-Treatment Process for added durability of the hard baked enamel finish. Pallet Flow Racking, or ‘Pallet Live Storage’ is ideal if you operate a First-in, First-out (FIFO) goods storage setup. With this system you can use up to 60% less space than if you were to use conventional pallet racking. Hannibal’s Drive-In Systems allow a significant increase in pallet storage density for high volume SKU’s. Pushback Systems are manufactured using heavy duty structural tube support rails combined with encapsulated flanged wheeled carts.